Tuesday November the 3rd sees us limping lamely along to the London Science Museum (£ Free), currently hosting the stunning Cosmonauts: Birth of the Space Age exhibition, a little steep at £14 each but very interesting for a space geek like me. The disappointing thing is not being allowed to photograph anything and to be honest, I’m feeling a little grievous at having to pay and not being able to take pictures. That’s why I decided to get some sneaky camera shots when one of the 1 million Science Museum staff weren’t looking, though I suspect my pictures won’t do the Cosmonauts exhibition justice. Well, I got 3 shots anyway. The Russians, although in the end they lost the race to the Moon, were the pioneers of space travel. They launched the first satellite, the first animals, the first man in space, the first woman in space, the first spacewalk and the first space station. The Cosmonauts exhibition, opened by the first woman in space, Valentina Terashkova, is billed as a once in a lifetime and it is truly an outstanding collection of 150 Russian spacecraft and artefacts to visit the UK. Valentina Tereshkova, the first woman in space, opens the Cosmonauts exhibition in London. All this at a time when America had launched only one astronaut into space. The achievements of the American space programmes, Mercury, Gemini and Apollo are well documented but it wasn’t until 1989 that Russia acknowledged its manned lunar program. 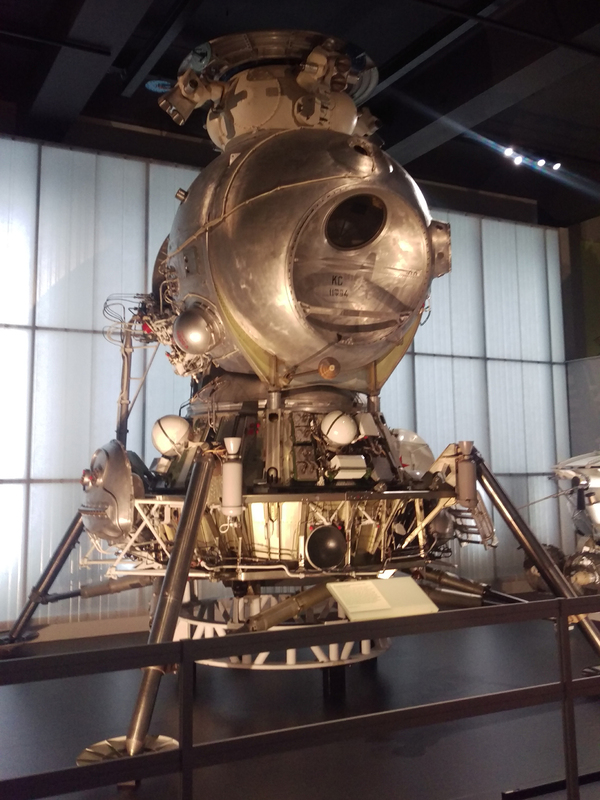 On display at the Cosmonauts Exhibition is the 1969 Russian LK-3 Lunar Lander, the most complete lunar lander in existence. This 5 metre tall spacecraft is somewhat smaller than American version and would only have carried 1 crew member down to the surface and back again. They would have had to space walk to the waiting spacecraft in orbit. It looks stunningly scary, bare bones and best described as nothing more than functional. The Soviets had lost the race to the moon, the death of their Chief Designer, Sergei Korolev, was also their driving force and instead, the Soviets focused on the Salyut space station after the American moon landings. Behind a glass case is Vostok 6, the capsule flown by the first woman in space, Valentina Terashkova, who also opened the Cosmonauts: Birth of the Space Age exhibition here at the London Science Museum. This sphere shaped capsule looks distinctly other worldly, scorched with fraying fabric type, burnt and basic. It is stunning, you can’t stop looking at it and wonder what it must have been like to plummet through fiery atmosphere as layers of its heat shield peeled away. How terrifying it would be when she had to eject from the capsule via parachute when 7 miles up returning to Earth. Opposite is Voskhod 1, the first capsule to carry more than 1 crew member. Carrying Vladimir Komaorov, Konstantin Feoktistov and Boris Yegorov would have been a very snug fit for all three cosmonauts. Vladimir Komaorov would later become the first human to die on a space mission during Soyuz 1. 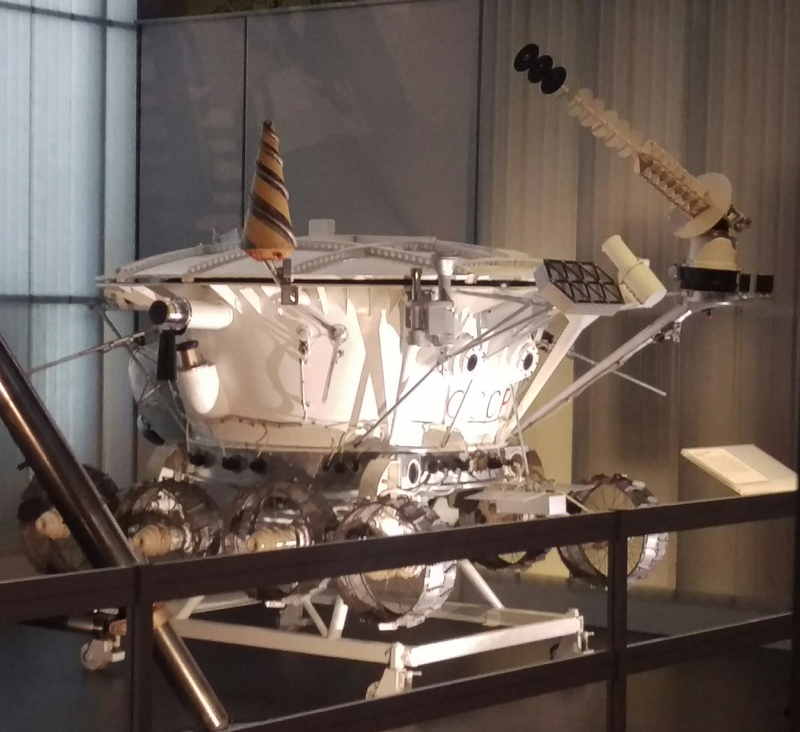 Displayed are also engineering models of Sputnik, the Lunokhod lunar rover, a Venera 7 descent module on display was used for drop tests on Earth for a soft landing on Venus. Also Tsiolkovsky’s original drawings, Yuri Gagarin’s military uniform, Russian space propaganda, paintings of rocket engineer Sergei Korolev, spacesuits, including the spacesuit of Helen Sharman, the first Briton in space. There are also animal artefacts including a dog ejection seat, When you consider that by the time Yuri Gagarin became the first man in space 1961, 48 dogs had gone to space, only 28 survived. 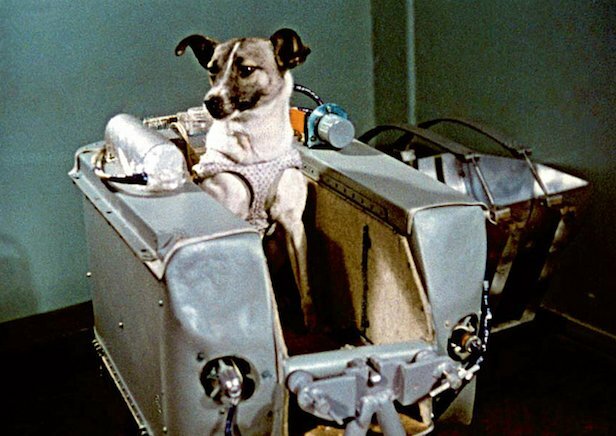 Spare a thought then for the first space dog, Laika. Laika was killed this day in 1957 by extreme stress and overheating when she was aboard the Sputnik 2 spacecraft becoming the first animal to orbit the earth. Laika was a stray found wandering the streets of Moscow and one of three dogs to be trained eventually becoming the flight dog. Sputnik 2 was never designed to be recoverable and that poor dog died for no justifiable reason as scientists were already convinced that people could survive in space. She only went up because the Soviet leader, Nikita Khrushchev, wanted to deliver a “space spectacular” during the cold war and space race. I think about that poor dog often and wonder if man is dogs best friend. The Cosmonauts exhibition is fantastic, the hardware is a sharp contrast to the American Apollo 10 Command Module that you see after exiting the exhibition. You will not be disappointed. The book that accompanies the Cosmonauts Exhibition is well worth the £30. The only other place in the UK to see Soviet space hardware is the National Space Centre in Leicester where they have a Soyuz spacecraft on display.